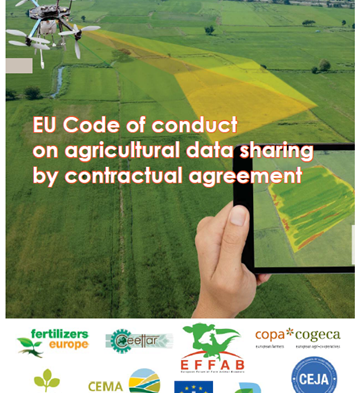 The co-signatories of the joint ‘EU Code of conduct on agricultural data sharing by contractual agreement’ officially launch the final document on Monday, 23 of April 2018, at COPA-COGECA’s offices (Rue de Trèves, 61 – Brussels). CEMA – European Agricultural Machinery, Smart AKIS partners is one of the promotomers and co-signatories of the Code, jointly with COPA-COGECA and CEJA among others. This event will count on the presence of Mr Phil Hogan, EU Commissioner for Agriculture and Rural Development and Mr Carl-Christian Buhr, Deputy head of Cabinet DG Connect who will provide the views from the European Commission on how data sharing can be a key driver to promote digital farming in a competitive & innovative European agriculture and agri-food chain. Furthermore, the Code sheds greater light on contractual relations and provides guidance on the use of agricultural data, focusing particularly on the rights to access and use of data. Information on CEMA’s website in link.